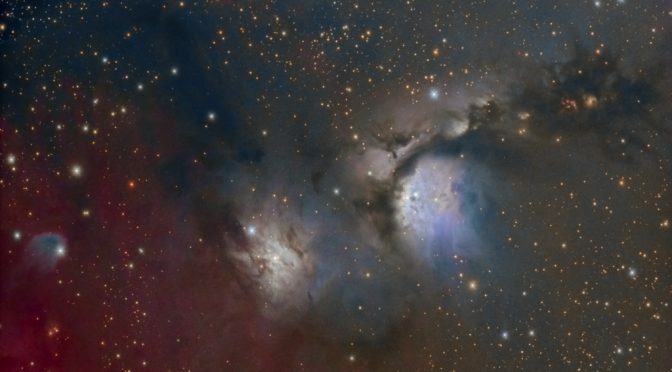 Orion is a rich area for deep-sky objects, and it’s somewhat of a shame that M78 is so often overlooked, with the Orion Nebula, Horsehead and Flame taking centre stage. The smaller area of nebulosity to the north (NGC 2071) is illuminated by HD 290861 and is encompassed by further blue reflection nebula. It is also surrounded by the continuation of the sinuous dust lane. 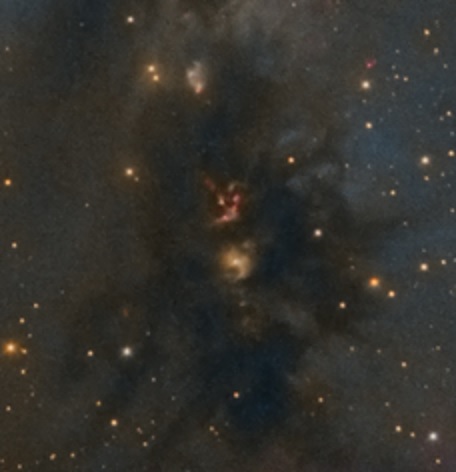 The dust in this image hides a lot of hidden activity – some of which is revealed in the image and is highlighted in the crop (displayed at 200%) – this shows Herbig-Haro 22 and 24 along with McNeil’s Nebula (top-centre). 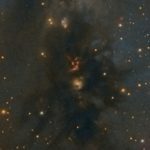 Within these regions, newly born stars start to illuminate gas around their birthplace, while jets of material from these stars collide with surrounding gas and dust. T Tauri type stars are also found in these dusty regions. These are stars that do not have a core hot enough to trigger hydrogen fusion (but may burn lithium), and are not yet in hydrostatic equilibrium, whereby gravitational forces are balanced by outward pressure due to heat from within the star. Heat is produced by gravitational contraction during this intermediate phase between a true protostar and a main sequence star. It does offer a look back in time to a phase our own sun would have passed through before the formation of the solar system from the solar nebula. Finally, to the top (north) of the image, we start to see a large area of HII emission that merges into Barnard’s Loop. Within this, there is an interesting bright nebula near HD 290857 with only one reference that I’ve been able to find through Simbad. 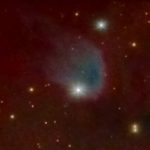 The reference comes from a 1977 paper, “A catalogue of bright nebulosities in opaque dust clouds” (Bernes C., 1977A&AS…29…65B), and as such the nebula gets the classification Be 100 (listed as [B77] 100 in Simbad). The nebula (shown) forms part of the much larger L1630 molecular cloud. 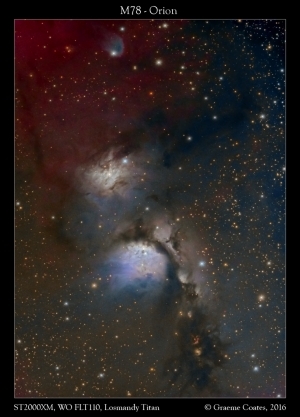 Image was taken using William Optics FLT110 with FLAT4 reducer; SBIG ST2000XM; Losmandy Titan with Gemini 2. Reduction and processing in Pixinsight and Photoshop CS4. Images acquired Nov/Dec 2016 from Oxfordshire, UK.